Healthy Lifestyles - Does Tea Really Count? So is green tea really the panacea of all things healthy? Believers claim it protects our hearts while it diminishes the risk of fatal illness, protects against cancer, helps liver function, assists in weight loss and provides hope to Alzheimer's victims. One thing we do know, tea is also a good source of fluid. I feel such pressure everyday to drink 8 glasses of water and rarely, if ever, do. It’s important to remember that it's not necessary to get all your fluids from drinking water. Soups, tea and fruit provide necessary fluids too. And tea doesn't dehydrate like coffee, because it’s very low in caffeine compared to coffee. Tea seems to offer some real health benefits. But, like most cure all's, it's going to take a lot more research to identify exactly what and how it helps us. In the meantime, I'll be drinking my tea for pleasure and hopefully receive some extra benefits in the bargain. To find out more about varieties tea, visit Tazo's website. Their tea is excellent and the site is just plain fun. Tags: green tea , antioxidents , healthy lifestyles , dehydration . You'll warm up to this short and sweet take on a familiar fruit that's usually served cold...grapefruit! In the spirit of yesterday's post, Healthy Eating & Maple Sugaring Time, here is a delicious healthy eating example of how you can enjoy a simple carbohydrate like maple sugar with a more complex carb. Also a great source of fiber and vitamin C, grapefruit helps to support the immune system and may even help reduce cold symptoms or severity of cold symptoms. This is one healthy recipe that can help you forget flu season for good! The British show, "Make Me a Supermodel" has women competing for the top spot, which is decided by viewers. Miss Jen Hunter, the winner, was reduced to tears at times through out the show by the "judges," members of the fashion mafia that never met a starvation victim they didn't want to photograph, as "too fat" with "stocky legs" and admonished her for her desire to show that "larger women can be models too." Miss Hunter's rival as a finalist, Marianne Berglund, was praised though out the show for her "sensational" body. They appeared in the same swimsuit which viewers made their final votes with. There's nothing I can say that could add anything to the picture, so I'll just leave you with the link to the article about the stick-thin model controversey, and the picture below. Please take a deep breathe before you scroll down. Ever since Marsha posted that beautiful picture of strawberries a few days ago I couldn’t get them out of my mind. When it comes to getting fresh fruit, living in California (the largest US producer of strawberries in the US), can be a blessing - because right now our markets are loaded with them. Unfortunately, ‘fresh fruit’ doesn’t always translate to great tasting. There is still a preponderance of hydroponically grown produce that reach our markets which are often unripe and tasteless. And as y’all know, there's a big difference when produce is allowed to grow naturally and ripen on the vine and when it does, it's yum! 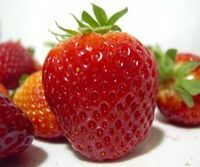 Like all fresh fruit, strawberries can be expensive, although usually not as expensive as other berries. If you haven’t put a big, ripe strawberry in your mouth in a while – get to it! You may be very surprised how sweet and satisfying they are. Dipped in a little dark chocolate and you have a scrumptious healthy treat. And not that it really matters, because they’re just good eatin’, but one cup of sliced strawberries has only 50 calories, no fat, no cholesterol, and almost 4 grams of fiber. Not to mention they are filled with high levels of phytochemicals. One more consideration. Whenever possible, look into buying your produce locally. This way you make sure to get the freshest and best produce and it's a great way to help local agriculture stay viable while adding to the quality of life in your region. nutrition , strawberries , healthy lifestyles , phytochemicals . Exercise and Menopause - Does It Help? (I’m actually surprised that substance abuse didn't make the list, because just reading that makes me want to pour a very large martini and drink it while I’m making another). Tags: menopause , fitness , healthy lifestyles , hot flashes . At a noon press conference today in Chapel Hill, N.C., John Edwards announced that his wife's (Elizabeth Edwards) invasive ductal breast cancer has recurred and spread to her rib bone. Originally diagnosed in 2004, Mrs. Edwards' breast cancer was believed to be in remission until a routine follow-up appointment on Monday. "Her bone cancer," stated John Edwards, "can not be cured, it can only be treated." "Invasive ductal cancer is the most common form of the disease, accounting for 70 percent to 80 percent of cases", according to the American Cancer Society, and "almost 180,000 American women will be diagnosed with breast cancer this year." Indeed, many of our lives have been personally affected by breast cancer, through either battling the disease ourselves or supporting a friend or loved one in treatment. The Ohio State University's James Cancer Hospital and Solove Research Institute, believes healthy eating can help to reduce your risk of getting cancer. Current research is being conducted to detemine how different foods such as black raspberries and broccoli can prevent recurrence or slow the progression of certain types of cancers. The cancer preventing benefits of today's recipe are supported by a February 16, 2007 study by the American Institute for Cancer Research which concludes that just two servings of broccoli provide better protection than vitamin supplements against some of the main agents of cancer: free radicals. Our support goes out to Mrs. Edwards and the thousands of American women fighting breast cancer. Please share this and other healthy recipes with your female friends and relatives, and remind them of the importance of self-breast exams and mammograms. Mix the dressing ingredients together and set aside. In a large bowl, combine the broccoli, cauliflower, onion, carrots, bacon and raisins. Pour dressing over the vegetables and toss top with shelled sunflowers seeds, if desired. Let sit overnight. My post last week on the study that compared diets made me think it’s worthwhile to explore the subject of carbohydrates again on this blog. That study showed that people who followed an Atkins-type diet (albeit with more carbs) had somewhat more success in losing weight than people on other diets. I'm not suggesting that a modified Atkins diet is the way to go (read last week's post), but thought it'd be worth a look at what might be going on. Researchers agreed that the ‘success’ had a lot to the type of carbs people ate. That is, whole carbohydrate foods as opposed to highly processed ones. Things like whole wheat, original oatmeal (not the instant kind), whole fruits and vegetables. Something that studies show people still don't get enough of. I just read some research yesterday saying that almost 90 percent of Americans don't get the recommended amounts of fruits and vegetables (5-9 servings a day)! I haven't seen any research telling us how many servings of chips, candy, cookies and the like that we eat! Of course, this isn't really news for those who seek weight loss. The party line has always been to cut back on sweets, and use fruits instead for treats. And eat plenty of vegetables because they're low in calories. Yet the statistics tell the story. We just don't do it with any regularity, even though eating this way makes most of us feel better, and yes, weigh less. I recently took part in a listserv conversation that suggested one way we could effectively make changes in our diets. Of course, it had to do with mindful eating, or intuitive eating, whatever you want to call it. Mindful eating is all about listening to your body, and making choices based on how a food makes you feel. The listserv conversation had to do with how to stop eating things that don't make us feel well, not how to eat things that we think we ‘should.’ For many people, those foods include things like chips and candy; others can’t tolerate milk products. Actually, for every food, there’s probably someone who can’t tolerate it. The point is, when we clearly know a food affects us adversely, it’s up to us to decide if we really want that food badly enough to suffer the consequences. It becomes a personal decision motivated by what our bodies tell us – intrinsic motivation -- not one that’s driven by an attempt to meet healthy eating guidelines (an external driver). And intrinsic motivation is what really works. Why Do Sit Up's Stink? I don’t know why I hate sit ups. I always have. I can’t be the only one out there that never does them. For heaven’s sake, they’re not as hard as hiking a steep hill or any more difficult than some yoga positions. Think about it, sit ups are one of the few exercises you can do lying down - you’re already halfway home before you start! So why all the hate?! As I get older it’s hard to ignore certain facts, and one of those facts is that I’ll go to my grave never having seen myself with a flat stomach. Vanity aside, I have to admit that one of the most important pieces of the fitness puzzle is building core strength, especially important as we age. Building strength in your core helps alleviate muscle fatigue, strain and can even create less stress on your internal organs. When the core is strengthened you are better able to support your lower back, spine and extremities. One of the best exercises to relieve and even alleviate lower back pain and strengthen the core is sit ups - sigh. Nowadays we refer to them as crunches, but when you get older and your back actually starts to make a crunching sound, you prefer a less literal translation. “Many women are under the impression we have upper, middle and, lower abdominals. In fact the rectus abdominus is one muscle! We have lower fibers, middle fibers and upper fibers, but they are all within the same muscle. We also have inner and outer obliques. Typically we work the upper and middle fibers of the rectus abdominus muscles first, not realizing that the lower fibers are working at the same time. Therefore, those lower fibers are usually close to exhaustion before we even begin to concentrate on them. I suggest working those lower fibers of the rectus abdominus first. The pelvic tilt. Lay on your back with your feet hip distance apart. The most important thing to remember is spinal stabilization. Keep that back flat or in a neutral position on the floor or surface you’re laying on. Round you’re back into the floor by curling the pelvis upward. While doing this, the tendency is to try and lift the buttocks off the floor. Don't! Instead, think about pulling your belly button towards your spine as you exhale and curl. Diagonal Curl. Place your right ankle over your left knee (don't cross the leg over if you have a knee problem). Next, place your hands gently and low on the back of your head. Leave that right elbow on the floor as you roll upwards toward the right knee. If you have a problem with these, try to pretend that you're just rolling out of bed in the morning. Lean towards the bent knee but never try to touch the elbow to the knee. Instead, try to roll your left shoulder towards the right knee....works like a charm and helps to flatten that bell out nicely. Abdominal Crunch. Here's a tip on how to do this one correctly. Lay on your back with your feet hip distance apart and your spine stabilized onto the surface you're laying on. Then place your hands on the back of your head. (Think about keeping your thumbs low and your elbows wide on this one) Now, you're in the starting position for the abdominal crunch. Take a breath, and exhale as you roll upwards towards your knees. Never pull on your neck while performing this movement. Instead, try to think about rolling up from the chest and shoulders. If you can see about 6 inches above your knees you’ve come up far enough. As with all abdominal exercises, it is important that you breathe in a way that allows the correct amount of oxygen to reach the muscle that you're trying to work. Inhale in the ‘down’ position of the exercise and exhale on the exertion or ‘up’ portion of the crunch. For each exercise try to do one set of 10-15 reps 2-3 x per week then 2 sets, then 3 sets. Remember to take a day of rest in between. There’s a lot of time spent on this blog talking about an all or nothing mentality and I know it’s a tough one to get past. Just recently, I was reminded of my own struggle with this concept as I worked through yet another injury – a broken foot. Yes, I’m officially a klutz, tripping over myself walking out my front door. (I’m telling people it happened rock climbing in Peru, it’s much sexier). When an injury or any other legitimate circumstance takes us out of our every day routine, it’s easy to let other areas of our healthy lifestyle slip as well. For me, that can sometimes mean over eating, or at the very least eating food that’s easier and more convenient (try preparing dinner on one leg), which can translates into high fat, high carbohydrate. The problem is, when I become lethargic about moving my body, I usually get the same way about the food I eat – and how much I eat. Conversely, when I begin to overeat, which often makes me feel lethargic; I don’t feel much like moving my body. Throwing in the towel on both healthy eating AND physical activity is a sure recipe for weight gain. Years ago, a wise sage of Green Mountain fame told me to always remember that if you’re hanging on to one of the prongs of healthy living (healthy eating, movement and positive attitude), you haven’t thrown in the towel. You haven’t given up. You’re still being successful. So, you’ll excuse me while I go do a few push up’s against my dresser…and think good thoughts. Tags: fitness , intrinsic exercise , healthy lifestyles , perfectionism .